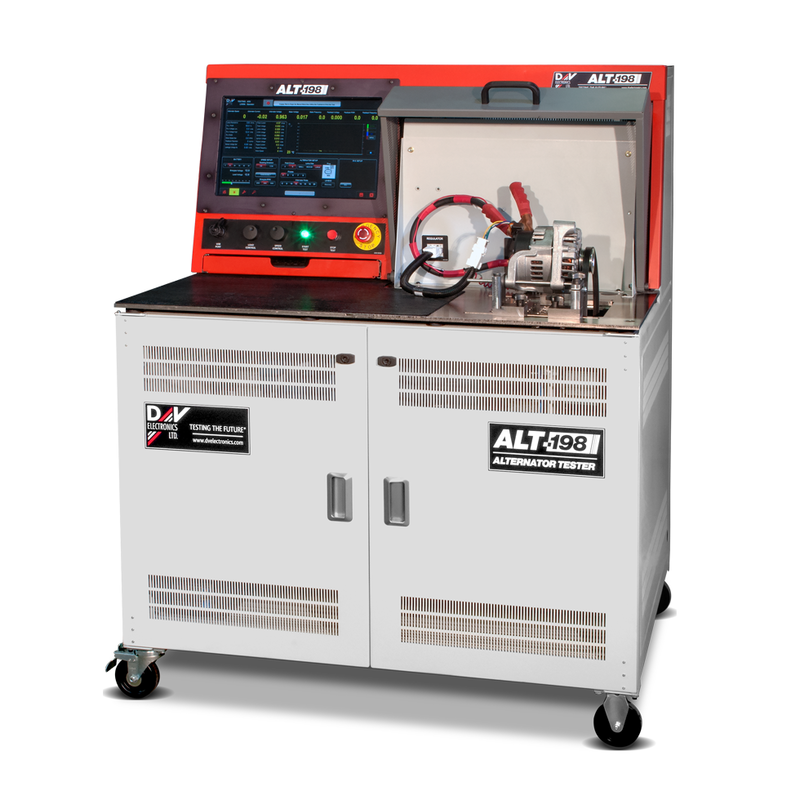 The ALT-198 is the next generation of our very popular ALT-98, built for the new era of automotive testing. Thank you for your interest in the ALT-198. Please fill out the form below so we can send you the brochure. Thank you for your interest in the ALT-198. Your request has been submitted to our sales department, and we will get back to you soon. The ALT-198 features an integrated 19” color touch- screen and PC computer with the new ALT-Pro software providing database management, customizable test profiles, advanced learning mode, manual mode, results and statistics monitoring, connectivity for results and specifications, and customizable pass/fail reports. This testing system is ideally suited for a variety of testing applications for OEM’s and remanufacturers including end of the line production testing, performance studies, and warranty evaluation. • Measures over 100 different industry standard parameters: turn on speed, voltage set point, remote voltage set point, LRC, SSD, field current, alternator performance curve etc. • Built-in oscilloscope for all signals: RVC, feedback, ripple current, LIN/COM, etc. • Checks all types of alternator and regulator terminals and functions such as computer control, soft start delay, load response control, tachometer frequency, feedback, under/over voltage indication, PCM control, RVC, LIN/BSS, etc. • More than 40 different alternator real time readings, including: speed, current, voltage, ripple current, rectifier leakage, rectifier voltage drop, regulator saturation voltage, stator voltage, feedback PWM, etc.